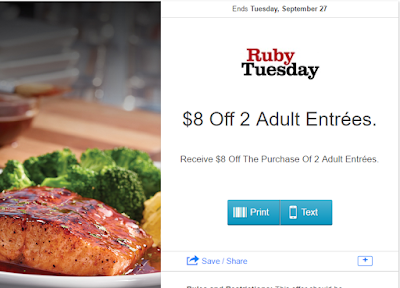 Savvy Spending: Ruby Tuesday's: $8 off two adult entrees, plus $5 cash back with Checkout51! 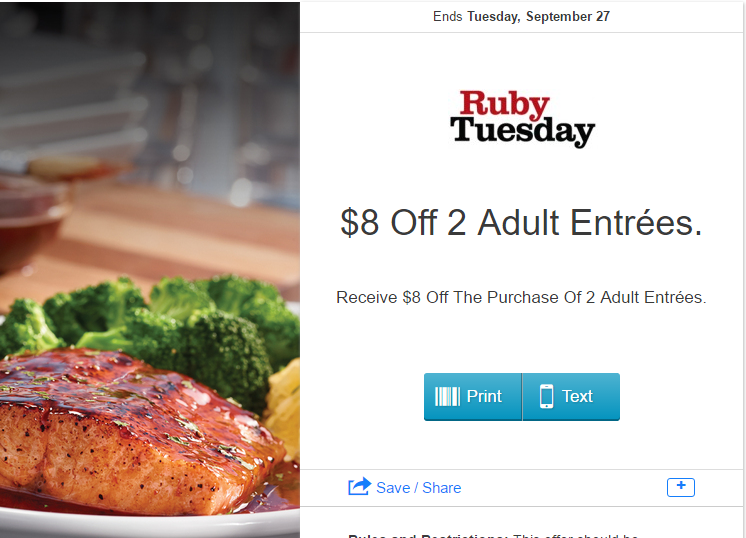 Ruby Tuesday's: $8 off two adult entrees, plus $5 cash back with Checkout51! You can also save another $5 if you're a Checkout51 member! They are offering $5 off your $15 order with their cashback offer (offers vary by account)! This offer expires 9/28! This makes for a pretty cheap night out... especially if you go when kids eat Free (Tuesday at my local Ruby Tuesdays. You can't combine the coupon with the kids eat free promo, but you can still submit for the Checkout51 offer)! So, if you don't have dinner plans tonight or tomorrow, consider treating yourself to a dinner out on the CHEAP!